Video showing three-dimensional bathymetry and Synthetic Aperture Sonar (SAS) image data collected by the KATFISH™ system of the USS L-8 submarine, which sank on May 26, 1926, near the entrance to Narragansett Bay. Video courtesy of Kraken Robotics. Download larger version (mp4, 8.1 MB). A team from the NOAA Office of Ocean Exploration and Research (OER), Kraken Robotics Inc. , and the University of Rhode Island Applied History Lab (URI AHL) recently started a project to image, for the first time, all four of Rhode Island’s sunken historic submarines using a new Synthetic Aperture Sonar (SAS) system. During the first phase of the project, three of the four submarines were mapped (the submarines USS G-1, USS L-8, and German U-853), along with the U-853’s last World War II victim – a merchant ship called the Black Point. This technology demonstration came about through a Cooperative Research and Development Agreement between OER and Kraken Robotic Systems Inc. This formal joint research and development partnership will combine Kraken’s technology and desire to design and manufacture advanced mapping and ocean exploration systems with OER’s ability to test and establish functionality of that technology while at sea. These technologies have the potential to lower exploration costs, produce better results, and reduce impacts on the environment while increasing our understanding of the deep ocean and spurring further technology development. 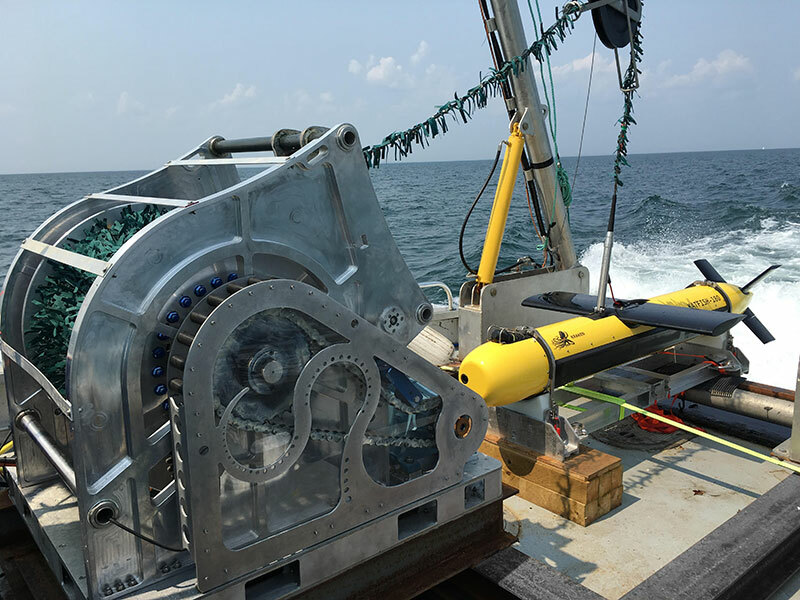 Kraken Robotics developed and manufactures the Kraken Active Towfish (KATFISH™) , which carries Kraken's Miniature Interferometric Synthetic Aperture Sonar (MINSAS) system. KATFISH™ is designed to be portable, quickly installed and removed from vessels as needed. The system collects three-dimensional bathymetry and ultra-high-resolution seabed imagery, providing detailed images of the seafloor and objects on it with 30 times more detail than generated by conventional side scan sonar. The KATFISH™ can image three square kilometers of seafloor every hour, collecting over three billion pixels of information. While the KATFISH™ was originally developed for high-resolution SAS and bathymetric surveys, its resolution and high-area coverage rate hold great potential for marine ecologist, biologists, geologists, and especially archaeologists. The system processes SAS imagery and bathymetry in real time, which allows researchers to analyze imagery during the survey, enabling them to make informed decisions and any required changes to the mission on the fly. This makes for the most efficient use of vessel time and provides the knowledge that all data has been collected and validated prior to the end of a mission. By providing more detailed imagery than the side scan sonar often used to image archaeological sites, SAS capabilities allow for increased understanding of shipwrecks, which in turn enables archaeologists to better assess submerged sites in their environmental and cultural contexts. Kraken KATFISH™ and Tentacle™ intelligent winch system aboard R/V Discovery. Image courtesy of Kraken Robotics. Download image (jpg, 746 KB). To kick off to the partnership, OER and Kraken Robotics decided to examine historic submarines with the assistance of URI AHL. The work aligns with OER’s mission to discover and characterize important historic underwater sites, while providing Kraken with a better understanding of the data and imaging requirements of OER. URI AHL provided the archaeological framework for the investigations. Rhode Island has played a key role in the history of American undersea naval warfare. The physical remains of this history are imprinted in the underwater cultural landscape of Narragansett Bay and Rhode Island Sound. Ships from the Revolutionary War lie on the ocean floor, as do the remains of later warships; merchant ships; military aircraft; and less readily identifiable artifacts such as submarine barriers, depth charges, and spent torpedoes. Of particular interest are four submarines in Rhode Island waters that played interesting and important roles in Rhode Island’s connection to naval warfare and underwater technology. During the first phase of this project, three of these submarines were mapped using the KATFISH™ high-resolution SAS system so as to better understand each site’s archaeological condition and the historical significance of the collection of submarines as a whole. Learn more about each of the submarines explored and see mapping results by visiting the pages below.